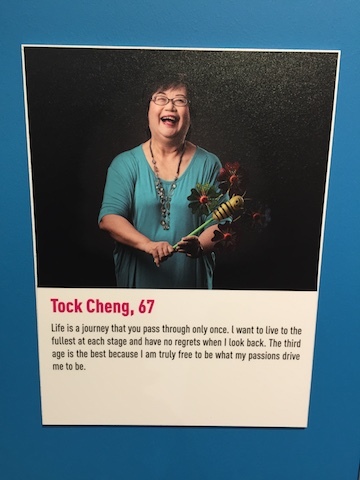 Three inspiring Dialogue with Time senior guides show that ageing is really just a number. I was a director for two years at Cummins Offshore, a company that makes engines for power stations and ships, and was asked to retire at age 60. For two years, I hung around as I didn’t know what to do. Then I got offered a job at a Swedish company but because of my age of 62, they only offered a two-year contract rather than a permanent position. Last year, I left the company and I set up an e-commerce company that did trading but it didn’t go well. I still am trading in Forex and I do make money to buy me lunch and coffee! It keeps my brain active as I have to make calculations. I joined a lot of senior clubs like Council For Third Age (C3A), taichi group, etc. How did you learn about Dialogue with Time? C3A was looking for people to work at Dialogue with Time this year and I responded to that. I was looking for some work to do that was not stressful and that paid me enough to buy a good cup of coffee. It fitted the profile and I applied. I was not confident that I would get it from my past experience of job applications. It was a surprise for me when I did get it. The audition process was tough. I thought the expectation was high. Anyway, it worked out well and I am happy. What have you learned since the exhibition has opened? I have discovered I am very good with children. I started to treat myself as a child and chatted as a child [to the children] and I didn’t act like their father. I asked them what they wanted to do or tell them what to do. 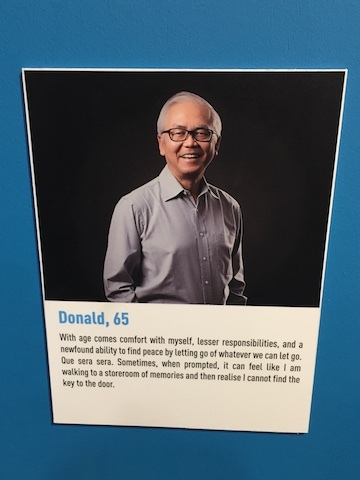 Donald and his three pictures. 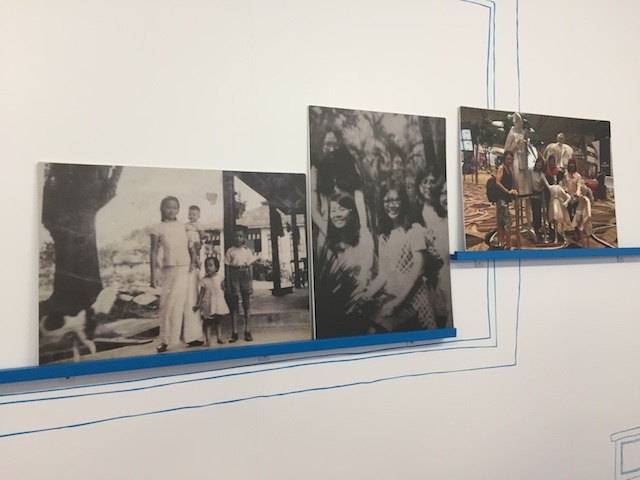 What were your three pictures that you share during the exhibition? A few words about your younger days? 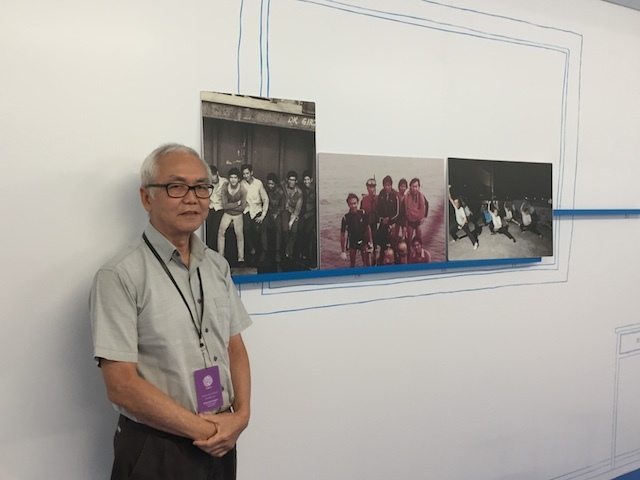 My childhood was tough; my father was an immigrant from China and mother was a first generation in Singapore. We were very poor. For example, I wore the same pair of white shoes for every occasion (wedding included), even when there was a hole. There were five of us in the family. Once a year, father brought me and my brothers to High Street to buy one shirt for one year. This was a common way of living. I told myself why get married as I saw my parents the way they were and I didn’t want to suffer like them. Wise words for other seniors? Just let go, don’t be too serious about things we see and hear. What keeps you busy these days besides being a guide? I am hoping to learn to play a musical instrument such as a piano. I love classical music; I had a small transistor radio when I was in my early teens and heard Tchaikovsky’s Waltz of the Flowers. I got such a connection [from that song] and I listened to that channel on the radio over and over again. What do you see about your ageing? I am surprised that I am 65, and quite flexible and mobile, and can touch my toes. I still enjoy life. I thought when I reached 65, I would be tired and aching all over. When younger, I always talked about structure and goals but now at my age, whatever comes, comes, it does not matter. I don’t have plans for the future. At age 50, I stepped out from a busy career. I was with SingTel in finance as an administrative for 27 years. From age 50, I did some self-employment, specifically insurance, and also freelance teaching. I did it for two years and really learned financial planning and realised I was unprepared when my mother had a stroke. Medical is very expensive. She had at that time no insurance, I was her insurance. In 2008, I decided to go back full-time to work in a publishing company doing administration. Stepped out again in 2015 and helped my niece who was an entrepreneur in the healthcare industry for two years till 2016, when she closed it. So after, I retired for real! I can say I have achieved financial freedom now. I found out through C3A. I threw in my application for fun. Ageing is something that draws my heart. I noticed they wanted to recruit seniors and that is a joy to know. Although there is so much hype about Human Resources being open to hiring seniors, in reality it is not the case. The recruitment process for Dialogue with Time was rigorous and we had to stand up in front of a crowd to tell our stories. It was arduous but I got to hear others’ stories as well. There was so much diversity. Ageing can be fun and very enriching having the other senior guides around because they are like-minded and have lots of talents. I get to blossom with them and they get to encourage me. My favourite photo is my family portrait when I was a baby. Then there is my 21st birthday in Botanic Gardens with my classmates from Singapore University (now called the National University of Singapore) and the last one, spending time with friends at Terminal Four in August this year. They represent three points in my life. Those days, Singapore was underdeveloped. Definitely not well-to-do, but we had sufficiency. My mom brought all of us up when my dad passed away. She was the breadwinner. There was lack of luxury. 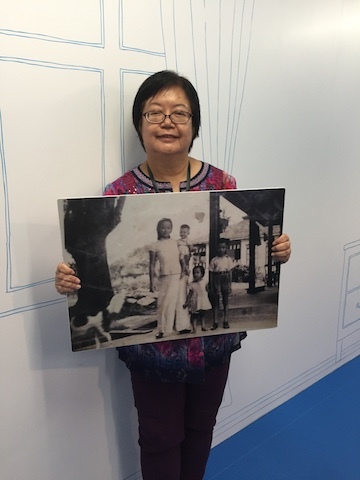 We lived under colonial rule and mother worked for the British as a domestic helper and was housed in the black and white quarters that was near the British family. The family had animals. Life wasn’t very bad. I had one brother and one sister. No complaints, I didn’t feel life was terrible. Life is a new discovery at the end of the day. That means, you can discover new things. Life is never dull, it can be challenging and it has its ups and downs. We must overcome and discover the things around us that are beautiful. Currently, I am caregiving my 97-year-old mother who is semi-mobile. A large portion of time is spent with her, while the rest of the time is with church friends and doing reading. I like spending time in solitude – I like sitting back and reflecting. I see my ageing as a process. I see there is a time it will terminate and that it won’t go on forever. While I am in this last lap, I want to give it my best shot. I would like to pass my knowledge of the Creator to my family. At this juncture, I don’t have specific goals but anything I lay my hand on to do, I want to do it the best. Singer Alan Jackson in his song “The older I get”, he shared that you must treasure every minute of your time especially at this time. It is not about material things that matter but about relationships. “And if they found a fountain of youth, I wouldn’t drink a drop and that’s the truth,” the song goes on. So, enjoy your age. In 2000, I retired from a shipping career, which I was in my whole life. I was the operations manager of a shipping company. I then started my own retailing business selling office equipment. My son took over in 2008 and I still help out. I spend a lot of time socialising with friends and networking. I found out about Dialogue with Time by chance through a friend. He and I applied and we both got in! I wanted to apply because it was something that I could do to keep active. 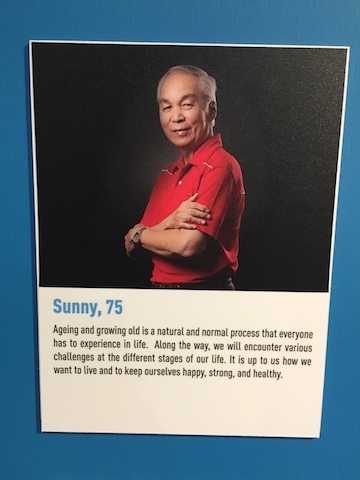 I thought it was about bringing people around as it is the Science Centre but when I came here during the interview process, I learned it had something to do with ageing. I embraced it. What you learned since the exhibition has opened? This is something new that I can look forward to. It brings us to a place where we can be actively involved and it is meaningful. We get to rediscover our lives again, even at our age. 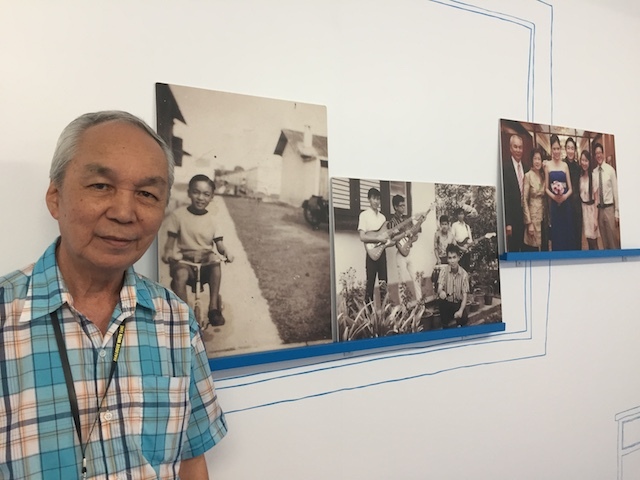 I was six on a tricycle in my neighbourhood in Whampoa estate, a teen in a pop band with other musicians, and a family photo taken at my son’s wedding. I come from a traditional Peranakan family. We were close to one another. We led a simple life and weren’t rich. My most memorable time was being part of the band for around three years. It was when pop songs were popular and when dancing first began. I was the lead singer of the band. I remembered when we were at a party and people dancing and we were entertaining them. Sadly, I have not kept in touch with them. Try to be active as you get older and try to engage with other people. I spend a lot of time with family and participating in church activities. I do a lot of online networking with friends through Facebook. I also am pursuing SkillsFuture courses. Don’t take life so seriously and let go if you can let go. Over here in Science Centre, meeting the guides, we found a pot of gold and they are like-minded and having same interests. I want to continue keeping active and strong. I was cycling for a while and I still walk a lot. It is important to accept what comes along and I want to be more involved with my grandchildren. If I could, I would turn back the clock to go back to when I was in the band and my courting times with your wife. I courted her for three years before getting married. We just spent a lot of time together and we did what we enjoyed.